Tekkon Kinkreet is a strange beast. Based on the original manga Black and White by Taiyo Matsumoto and directed by American Michael Arias, the film is a strange melding of American and Japanese sensibilities. Beyond that, it also combines various visual and storytelling styles, creating a movie that is 2D AND 3D, a child's tale AND an adult drama. Like the title of Matsumoto's original manga, this is a story that is all about stark dichotomies. Black and White (or Kuro and Shiro for the Japanese) are two orphan brothers living in the rundown city of Treasure Town. There they battle other street punks, glare at Yakuza from the alleys, and befriend a varied group of gangs, policemen, and other characters. Oh, and they leap across buildings in ways that would put even the Wachowski Brothers to shame. Black, the elder, is a brooding, independent boy who works tirelessly to keep White and himself alive in the ever-changing environment of Treasure Town. His brother, on the other hand, is a bright-eyed, innocent young boy who has weird psychedelic daydreams all the time and never seems to think about reality. They've just planted an apple seed near the pile of junk that they call a home when the relative peace of Treasure Town is disturbed by a man named Snake who takes over the operations of the local Yakuza gang. The problem is that Snake (not the most flattering name ever) wants to turn the entire city into an amusement park, while most of the inhabitants (including Black and White) aren't very keen on this idea. So begins a sprawling story wherein Black and White fight to survive (and keep each other alive), and friends from the Yakuza and police force work to keep the boys out of the reach of Snake and his superpowered henchmen. Having no experience with Matsumoto's manga, I can't really speak to the accuracy of the film's screenplay, but I can say that this is a truly unusual story. Sometimes it feels like a children's story, with White showing the virtues of a pure heart and imagination, but then it will launch into vicious bloody fight scenes in which Black jumps all over his enemies, clawing like an animal and battering them with his trademark metal pole. It is in this dichotomy, however, that the film really shows its merits. At one point, White comments to a police friend, "God made me broken. Black too. But I gots all the screws that Black needs. I gots every one!" Like yin and yang, these two brothers desperately need each other, and it is this need that forms the strong backbone of the film. Outside of that backbone are fascinating characters like Kimura, a Yakuza man with a soft spot for Black who, in an attempt to save his wife and kids from Snake's wrath, helps the slimy man with his nefarious plans. Kimura's painful grapples with love, truth, loyalty, and morality are real, emotional, heart-breaking experiences. Tekkon Kinkreet is a tragedy in the truest sense. It is about innocence lost and families torn asunder. Sometimes there are redemptions, but more often than not, characters meet violent, tragic ends. Director Michael Arias got his chance to work on this movie after working in the 3D animation industry for years, and his experience really shows. There are sequences in which a 2D scene will suddenly swivel in a continuous 180 degrees, creating a somewhat unnecessary (but no less impressive) shot that has rarely  if ever  been attempted in anime. The character designs are an interesting combination of Matsumoto's originals and Studio 4°C's distinctive style, but they're definitely an acquired taste with their small eyes and mouths. On the other hand, no character movement is spared by the animators at 4°C, who have  successfully  endeavored to make this "one of those movies" that makes up for its deficiencies with an artistic tour de force. Said tour de force only becomes a problem when it causes the team of director Michael Arias and scriptwriter Anthony Weintraub to spend nearly twenty minutes on a surreal scene filled with watercolors, highly-dynamic art, and tons of weird symbolism. It's an unfortunate, excessive ego-trip of a scene that is unfit for this movie and should have been nixed altogether. The only other big problem is that the film is simply too long. Perhaps this was due to Arias being a fan of the manga, since it seems like he tried to cram too much into one movie. A bit of the Peter Jackson effect, albeit without the Best Picture Oscar. All in all, I recommend Tekkon Kinkreet to most anime fans despite its flaws, if only because it is the first Japanese-produced anime to be directed by an American. Most viewers will come into this film for the beautiful animation, but the real meat lies in the characters: Black and White are reminiscent of Seita and Setsuko of Grave of the Fireflies in their tragic interdependence, and Kimura is a brilliantly-crafted side-character. This film shows, side-by-side, both Black and White, 2D and 3D, children and adults. 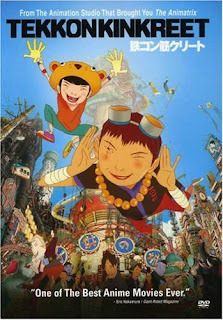 Like Yin and Yang, Tekkon Kinkreet maintains balance in all things.